It’s a new month which means one thing around here at LifeIntrigued – that’s right, quota reset time. I hope you enjoyed last month’s dedication to all things non-birding related. If nothing else, it sure cut down on the hate mail although the pro-birding contention was starting to get a little anxious. No worries, I have plenty of bird related posts in the hopper. I am currently sitting around wondering what the final toll will be on me due to a life list achievement yesterday – more on that in an upcoming post. For now, let’s just say – HOLY CRAP I HURT. My pain is your win since this affords me time to crank out a new post! 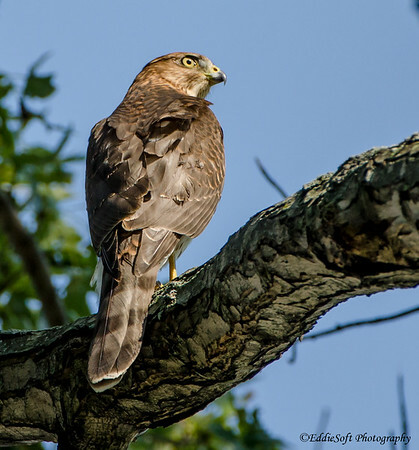 That happens to be a Cooper’s Hawk. It also happens to be composed in my favorite over the shoulder look making it one of my favorite shots of this cool bird of prey. This particular Cooper was quite the Zoolander, hamming it up for The Beast. Oh, and it can go left. Most of the time I have to hunt down the bird fodder. Instead, this specimen found me in Champaign, IL last year. I was actually there adding the super cool Swallow Tailed Kite to my birding list (link here). I’ll never forget the enjoyment watching that Kite soar overhead. Eventually it would take a wide circle out of our viewing area giving some down time to mingle with the other birders that had gathered that day. 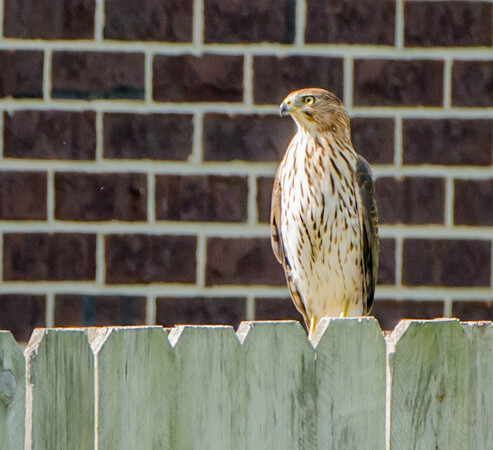 That is when this Hawk came flying in and perched across the street from us. Cameras up, shutters clicking. 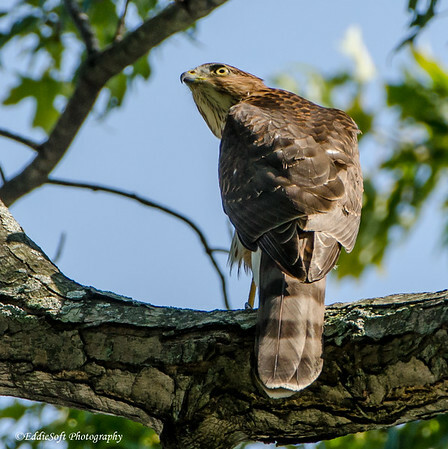 Hit the jump to see a few more shots of the Cooper’s Hawk. Here’s a nice shot of the back feathering for future reference. I lucked out that day because there were plenty of bird experts there to verify it was a Cooper. Having resources like that hanging around sure cuts out a lot of the painful research time. I also met a very nice lady – think here name was Devita but Ron will need to verify that for me – Talk about a wealth of bird knowledge – wow. Ron had met her on a previous outing and had commented on what a nice lady she was. Of course, Ron meeting someone on a birding outing is a completely redundant statement. These last few shots were taken while it was perched across the street. Seemed odd that it would choose to land right in the middle of a subdivision when it had an entire tree lined field on the side we were standing on. To be honest, I think it felt a little intimidated by the Kite stalking the skies. Hawks can hold their own against our standard bird allotment, but it had likely never seen a Kite before (it was uber-rare to be hanging out in Champaign which is why Ron and I had trekked down there) and it probably noticed those Kites possess some wicked talons of their own. On the other hand, this Coop was a total ham. After posing for us across the street, it flew towards us and landed in a nearby tree (where the first images in this post were shot). Eventually, it gave up the spotlight and went about its normal business – sad for us as much as it was likely for whatever it saw moving in the field. Note, it was a bit of irony taking pictures of a Hawkeye in the middle of Fighting Illini country! Nice pics! 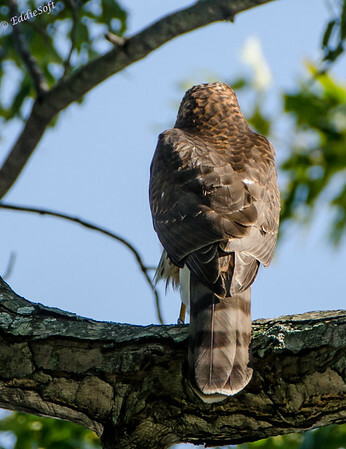 Just to lay out the characteristics of a Cooper’s Hawk vs. a Sharp-Shinned Hawk that is nearly identical: the Cooper’s Hawk has a more rounded tail, or really you have to say the outer tail feathers are shorter than the inner ones since sometimes they can be tucked in a little making the tail look a little more squarish; it has a larger head with a larger, more Roman beak and less of a beady eye look; it generally has a gray cap that does not extend along the nape; it has thicker legs; and its wings are roughly perpendicular to its body when soaring, which along with its larger head makes something of a flying cross. 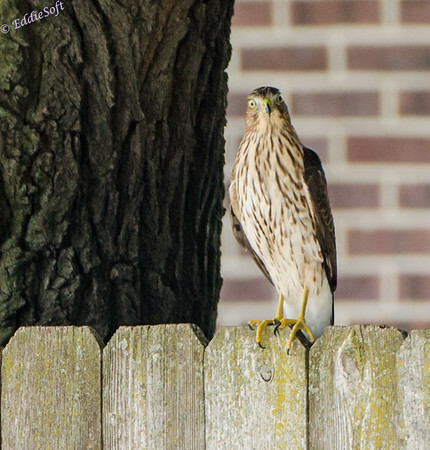 I believe you told me at the time that this was a juvenile Cooper’s Hawk, which correlates with its yellow vs. red eyes, the teardrop streaks on its chest, and the lack of the gray cap. Now that is a good synopsis of the differences. Luckily I had Devida there who simply said – “hey, there is a juvenile Cooper”. That point was duly noted and the shutter slapping began.